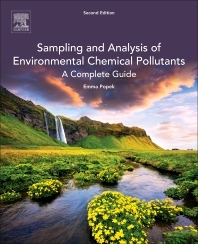 Sampling and Analysis of Environmental Chemical Pollutants, A Complete Guide, Second Edition promotes the knowledge of data collection fundamentals and offers technically solid procedures and basic techniques that can be applied to daily workflow solutions. The book’s organization emphasizes the practical issues facing the project scientist. In focusing the book on data collection techniques that are oriented toward the project objectives, the author clearly distinguishes the important issues from the less relevant ones. Stripping away the layers of inapplicable or irrelevant recommendations, the book centers on the underlying principles of environmental sampling and analytical chemistry and summarizes the universally accepted industry practices and standards. This Guide is a resource that will help students and practicing professionals alike better understand the issues of environmental data collection, capitalize on years of existing sampling and analysis practices, and become more knowledgeable and efficient in the task at hand. The three phases of environmental chemical data collection (planning, implementation, and assessment) are explained in a logical and concise manner. A discussion on the physical and chemical properties of environmental chemical pollutants promotes the understanding of their fate and transport. A chapter on common analytical chemistry techniques, methods of compound quantitation, and laboratory quality control and quality assurance may be used as a standalone introduction to instrumental analytical chemistry. Eleven case studies demonstrate the application of the Data Quality Objectives process to the development of sampling designs and illustrate specific data interpretation problems. Numerous call-out boxes in each chapter offer practical tips on widely used industry practices, which originate from years of experience in the field. Appendices contain the most frequently used action levels and reference material, calculation aides, and useful field forms and checklists. Authored by an analytical chemist and environmental pollutant expert with more than 30 years of experience in research and industry. 3.1. What are Data Quality Objectives? Emma Popek, PhD, is a practicing professional with a broad experience in all aspects of environmental data collection: analytical chemist specializing in oil fingerprinting; environmental laboratory director; field analytical services manager overseeing mobile laboratories in remote locations; and program QA manager in charge of technical documentation, field data collection, and data interpretation and reporting. I just read certain parts of the book and I really found what I was searching for in an easy way. I recommend this reference for any professional in the environmental laboratories field or professional in the environment field.